The Japanese group is set to freeze its Welsh Wylfa project, Nikkei says. The UK government can defend its view that nuclear provides secure and carbon-free power at an acceptable cost. But it will be politically tough to fill investment gaps if Hitachi steps back. 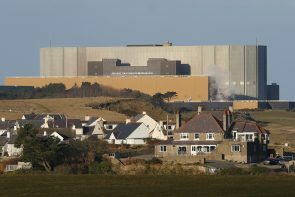 Britain may take a stake in Hitachi’s likely $20 bln-plus Wylfa power plant. That could make it cheaper than the controversial Hinkley deal. Yet it’s still a big bet on a scheme that energy shifts could render ill-advised, at a time when simpler public projects have been spurned. By reinstating sanctions President Trump increases the risk the Islamic Republic’s economy suffers and hardliners hold sway. He damages relations with EU states who should be key allies. And he makes it more likely oil prices spike – the opposite of what he seems to want. The federal energy regulator nixed Energy Secretary Rick Perry’s proposal to prop up nuclear and coal power. Instead grid operators will be asked how to improve energy reliability. That’s more logical, especially after bad weather showed no fuel source is immune from disruption. The Richmond-based energy outfit is acquiring the South Carolina utility in a $7.9 bln stock swap. Cleaning up the financial waste of Scana’s abandoned atomic plant will stretch Dominion’s debt, but gaining customers hungry for its natural gas should compensate. A U.S. government report properly identifies cheap natural gas for making the solid carbon uneconomic and undermining grid reliability. Some suggested remedies make sense, but others seem designed more to appease a president pledging to save coal jobs than to address the problem. The South Carolina utility is pulling the plug on two unfinished reactors and banking guarantees from Toshiba. Southern has given a temporary reprieve to its plants but investors are betting it will follow Scana. The country that birthed nuclear power is sounding its death knell. The Japanese company’s $3.7 bln settlement shores up Southern’s finances but leaves a cloud over its troubled reactors. Construction continues for now yet the utility is still on the hook for overruns. It may yet decide to pull the plug on the plant, and nuclear’s U.S. future. Germany’s battered utilities can get back more than 6 bln euros in past tax payments, the country’s top court decided. It’s the final stage in the sector’s rehabilitation, following big restructurings and settlements on nuclear liabilities – and sets the scene for M&A. Nearly 40 years after the worst meltdown in U.S. history, nuclear energy’s dire economics are leading Exelon to pull the plug on the plant. Its carbon-free power is a valuable asset, but one that lacks political support as President Trump threatens to abandon the Paris accord. The Japanese group may ditch its recently hired Big Four auditor for a smaller firm, the Nikkei reports. That won't win back trust from regulators and investors. But Toshiba is desperate to retain its stock market presence, and the impasse with finicky PwC put that at risk. Relegation to a lesser section of Tokyo's stock market would be humiliating, and prompt some forced selling. A delisting would hit investors harder. Whatever happens to the shares, management has more existential problems to fix, especially in its nuclear unit. The stricken Japanese group is mulling a sale of its power meter subsidiary for $2 bln. The proceeds are unlikely to shore up finances much. But disposing of a non-core, underperforming unit is sensible, and it may help Toshiba hold on to more of its prized chip unit. New York Governor Andrew Cuomo hailed a decision to shut down the Indian Point facility as a win for the environment. Low natural gas prices are what really pulled the plug. Carbon trading might give nuclear energy a fighting chance, but good luck with that under President Trump. The $14 bln conglomerate may take another multibillion-dollar writedown at its nuclear-power business, on a unit purchased for nothing up front. That will further weaken the indebted Japanese group's balance sheet - and reignites fears about management's grip on the company. The troubled, state-controlled French utility has raised 4 bln euros by selling a 49.9 pct stake in its power grids. EDF’s plan to repair its weak balance sheet is on track. But a deteriorating business and more government-directed investments will short-circuit any recovery. Germany’s constitutional court has ruled in the troubled utility’s favour over an 8 bln euro compensation claim following the government’s U-turn on nuclear power. A payout should ease E.ON’s balance sheet headache and vindicate its decision to delay a much-needed capital hike. The approval of Britain’s new nuclear power plant puts politics ahead of sense. Consumers could end up paying 15 bln pounds in today’s money. New ownership tests erode the country’s reputation for openness. Brexit has undermined Britain’s bargaining power.